Unless you have been to a five-star sushi restaurant in London, you may not have tasted the true authenticity of Japan’s national dish. Whether you are an amateur sushi eater, or a big fan who knows their sushi from their sashimi, there is something delicious for everyone to try. If you are thinking of booking an awe-inspiring trip of a lifetime with a Japan tour, then take a look at our guide to the best restaurants where you will find some of the finest sushi in Japan. One of the most artistic, modern sushi restaurants whilst preserving the authenticity and tradition of sushi making, Sushi Hayakawa is a sophisticated location to sample the delights of Tokyo. The highlight is a wooden platform at which chef Akira Hayakawa makes some of the best sushi in Japan. Akira has worked is some of the top sushi restaurants in Japan, studying the various types of Japanese cuisine, but here he employs cooking methods not normally seen in other sushi restaurants. Tantalise your taste buds with his signature dish of tuna belly served on charcoal-broiled roll with flakes of truffle. As you can imagine, this comes with a slightly higher price than other sushi settings, but don’t let it put you off. Here you will experience a dining opportunity like no other. The delightful sushi restaurant located in the heart of Kyoto is a great place to stop off for something small and light during your busy day of exploring the city. The conveyor belt of sushi provides plenty of choice, with duck and beef as well as traditional fish dishes featuring and all for great prices. Musashi Sushi is the perfect place to go if you’re in a rush to your next destination, with fast, friendly and efficient service to make your authentic sushi experience even more enjoyable. For those who are new to the sushi eating experience, Chojiro in Kyoto is for you. With iPads detailing the menu in English and photos of the sushi to make sure you know what you’re ordering, this is a great opportunity to see how traditional sushi making meets the 21st century. The portions of the fresh fish delivered daily are great value for money, but be prepared to queue for a table as the restaurant can get very busy. We recommend visiting during the day if possible. Daiki Suisan Group deals in all things fish, from the daily distribution to selling at markets and having their very own sushi restaurants situated in Osaka and Nara. They are renowned for the sourcing of top quality fish with very reasonable prices. “When it comes to sushi in Japan, everyone wanted to eat at a 6 seat sushi restaurant with an elderly sushi chef behind the counter. And you should. But don’t pass up a chance to eat at bigger sushi restaurants just because it doesn’t feel ‘quaint’. Fresh fish and skilled hands can still be found at the larger restaurants. If you are looking for a sushi conveyor belt restaurant that has a discreet atmosphere combined with exceptional food, Genrokuzushi Sennichimae in Osaka is the place to go. The sushi is made right in front of you and for only ¥135 (around 96 pence) you can have any sushi dish that you wish. There is a sushi menu translated to English with pictures of the fish used for each type of sushi and the staff are more than willing to help with any questions. It is certainly a gem in the middle of Dotonbori, known for its eateries and splendid sushi restaurants. Harukoma in Osaka serves up a mixture of sushi and sashimi, both in delicate yet large pieces, fantastic value for money! This is a very popular restaurant and queues are likely throughout the day, but don’t let this put you off. Choose from generous cuts of top quality, fresh fish which will melt in your mouth, or the miso soup if you want something a little less daring. Whatever you prefer, there is something for everyone to try at Harukoma. When dining in a particularly high-end sushi restaurant it is always a good idea to ask the chef his recommendations on that particular day, as the fresh fish delivered daily can vary in size. But if you are to interact with the chef, keep it to a minimum as they won’t appreciate it if they are constantly distracted. 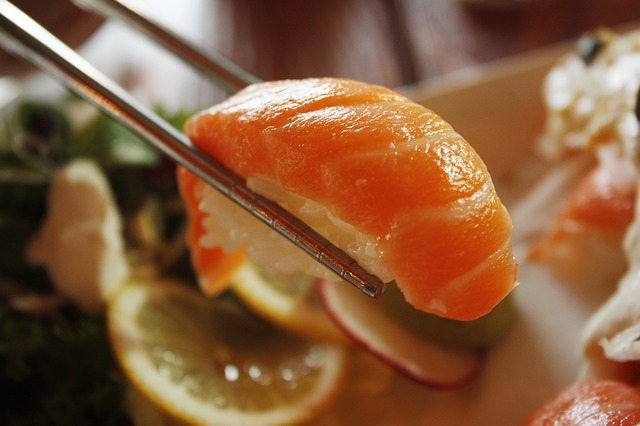 Most and nearly all of the sushi eating locations in Japan provide a towel to clean your fingers with in between the dishes, but avoid wiping your mouth with a towel! When adding soy sauce or wasabi, only add to the bowl in very small amounts. 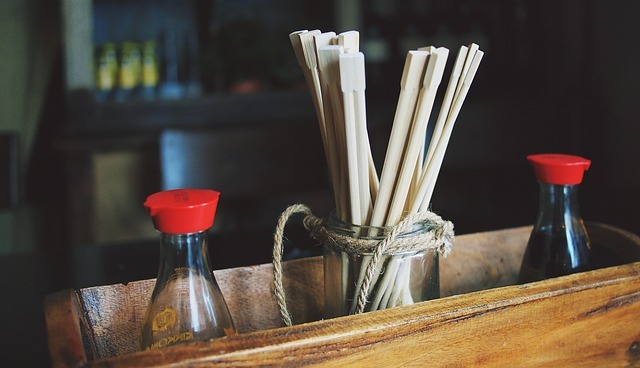 Wasting soy sauce is a serious taboo in sushi eating etiquette, and avoid placing wasabi on the pieces of sushi, as the chef believes it will ruin the delicate flavours and textures that sushi is commonly known for. The traditional way to eat sushi in Japan is by lifting a piece between your thumb and middle finger, not by using chopsticks, but if you find it more comfortable to use the cutlery there will always be a pair provided! But by using your hands you will be able to experience the texture using different senses. 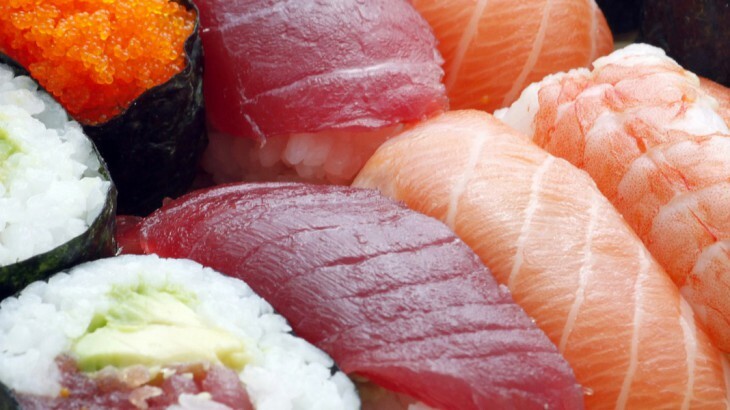 Taste Japan’s delicious sushi with Wendy Wu Tours, the UK’s leading Asia Experts. 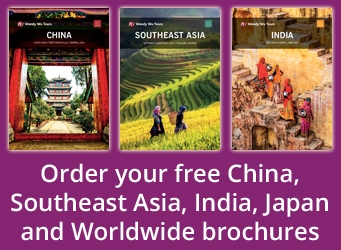 Our award winning tours to Japan visit all the major sights for an unforgettable holiday. Sushi is by far my all time favourite cuisine. I’m really hoping one day I’ll be able to afford to go to Japan and eat in some of these places!